Linda Ortega chose to buy a house next door to a centuries-old South Valley church that she once considered her spiritual home. Two syringes and latex gloves litter the base of a wall of San Jose Church. South Valley residents say intruders scale the fences, sometimes leaving graffiti and evidence of drug use. San Jose Church sprang to life during the Christmas season, on certain feast days, and especially during Lent, when as many as 100 people crowded into the tiny church, Ortega recalled. But the church at 2100 La Vega SW has remained silent since early 2013 when it was closed by the nonprofit that owns the property. Before the church was closed, a group of Penitente brothers say they opened the church regularly for religious services and welcomed the community to attend. Today, the nonprofit that owns the property bars the Penitentes and plans eventually to reopen the church as a venue for public events other than religious services. The church’s contents – including pews, life-sized santos carved from cottonwood, and even a wood-burning stove – were removed, people familiar with the church said. Fences that surround the three-acre property do little to stop trespassers, Ortega said. “Sadly, the property has been vandalized with graffiti, trash – lots of unsavory things going on behind the church,” she said. The property recently showed evidence of visits by drug users, who left used syringes and other paraphernalia near a rear wall of the church. The property today is fenced and locked while the legal dispute simmers between a group of Penitente brothers, who claim the church as their heritage, and the Atrisco Heritage Foundation, which has owned the property since 2006. San Jose Church, a centuries-old South Valley church, was closed in early 2013, barring Jose Maria Perea and others from performing religious services there. The church’s contents, including carved santos and the church bell, remain in storage. The Sociedad de Nuestro Padre Jesus, a group of Penitente brothers, filed a lawsuit last year in state District Court against the foundation, challenging the nonprofit’s legal right to bar Penitente brothers from the church. The Penitente Brotherhood is a lay fraternity of Catholics that provided spiritual leadership for centuries in New Mexico and southern Colorado. Even San Jose’s name is the subject of dispute. Court records refer to it as San Jose Church, but Penitentes call it the Morada de San Jose – the Spanish word for a Penitente church. A spokesman for the Atrisco Heritage Foundation called it a Catholic church that for centuries was owned in common by heirs of the Atrisco Land Grant, who settled in the area more than 300 years ago. Archbishop of Santa Fe Michael Sheehan called it a “chapel,” long used by Catholics as a place of worship. But the Roman Catholic Church does not own the property and has no stake in the outcome of the legal dispute, he said. Peter Sanchez, executive director of the Atrisco Heritage Foundation, said the nonprofit is eager to renovate the church and open it to “the entire community” rather than a small group of Penitente brothers. Jerome Padilla, president of the town of Atrisco board of trustees, stands in front of San Jose Church. Padilla and others want the church to be reserved for religious purposes. “Their argument is that five or six people should be able to use this church exclusively,” Sanchez said of the Penitentes, whom he called “tenants” of the church in recent decades. Sanchez contends that the Penitentes controlled access to the church and largely closed it to the broader community. Sanchez also contends the church is in good condition and that the foundation is maintaining the property. Ortega and others reject the contention that the church was closed. The Atrisco Heritage Foundation was formed in 2006 by the now-defunct Westland Development Corp. to preserve cultural properties, including San Jose Church and three cemeteries. Westland was the successor to the Atrisco Land Grant. A key issue in the lawsuit is the validity of a 50-year lease that Westland granted to the Penitente brotherhood in 2006, giving it use of the church, according to the lawsuit. The Atrisco Heritage Foundation in its response denied that the Penitentes have a legal lease with Westland. Sanchez said the nonprofit intends to restore the church and develop the property into an asset the community can use for a wide variety of events. The foundation is working with a group of University of New Mexico graduate business students “to develop a strategic plan and feasibility study to develop the property in a way that is more beneficial to the community,” Sanchez said. He said the project is modeled on the Old San Ysidro Church, which is owned by the village of Corrales and leased for events ranging from weddings to performances, but not as a church. The foundation also wants to register San Jose Church on the National Register of Historic Places, he said. The designation makes owners eligible for investment tax credits to pay for rehabilitation of historic structures. Religious artifacts removed from the church “are stored safely under our control,” Sanchez said. The foundation would not oppose handing the artifacts over to the Penitentes if a judge determines the rightful owners. “We simply want the courts to decide,” he said. Tension between the Penitentes and the Atrisco Heritage Foundation led to a confrontation Oct. 4 when foundation board members opened the gate to allow UNM students to view the church and a Penitente leader tried to enter the property, according to a Bernalillo County Sheriff’s Office report. The conflict began when Jose Maria Perea, a spiritual leader of the Penitente group, drove his motorized wheelchair through the open gate when board members ordered him to leave, according to the report. Perea told a deputy that board members grabbed him and his wheelchair in an attempt to force him off the property. Neither Perea nor the board members sought criminal charges. Perea, Ortega and other South Valley residents say they oppose the foundation’s plans to use the church for nonreligious purposes, such as community events. San Jose is among the oldest churches in the region and should be used exclusively as a church, said Jerome Padilla, president of the board of directors of the town of Atrisco grant, a political jurisdiction composed of Atrisco heirs. “We want to protect the traditional practices on that land,” he said. Perea called the church a “cultural sanctuary” that for decades served both the Penitente brothers and the larger community. Generations of Penitente brothers are buried there, both on the grounds of the church and under the church’s floor boards, Perea said during a recent visit to the church. Many of the graves are unmarked, he said. “Every inch that you dig under this, there are bones of our ancestors,” he said. BAYARD – The southern New Mexico mining town of Santa Rita no longer exists, even as a ghost town, except in the memories of Terry Humble and others who lived there. The ground beneath Santa Rita has been blasted, shoveled and trucked away over the last century to feed the world’s demand for copper, leaving a hole a mile-and-a-half wide and 1,500 feet deep. The Chino Mine, located about 12 miles east of Silver City, is among the world’s largest open-pit mines and still growing. Endless lines of huge Caterpillar trucks, each hauling 300 tons of copper ore and waste rock, grind slowly up steep inclines day and night. Some 960 workers continue to expand the massive hole. All around are mountains of waste piles that dwarf many of the taller peaks in this rugged area. When Humble, 73, returned to Santa Rita in 1963 after a hitch in the Navy, he realized that he needed to begin collecting photos and other evidence of his hometown before the growing pit swallowed it completely. Today, Humble and others are mourning the end of the labor union he joined in 1967 when he began work as a mechanic at the Chino Mine. The Sept. 18 union election ended one of the nation’s most storied unions, the International Union of Mine, Mill and Smelter Workers Local 890, commonly called Mine Mill Local 890. The National Labor Relations Board certified the election results Sept. 30. The union’s supporters say the move reflects a generational change by young miners who didn’t live through the struggles faced by their predecessors. Improved mine safety and better wages played a role in declining union membership, said Humble, who co-authored a book, “Santa Rita del Cobre,” about the town and the mine. In 1970, wages at Chino ranged from $24 a day for laborers to $32 a day for machinists, he said. Hourly wages today at the Chino Mine range from $12.35 an hour for laborers to $23.20 an hour for a top mechanic, according to a three-year United Steelworkers contract negotiated in 2011. Wages are raised $1.50 an hour if copper prices exceed $2.75 a pound. A 1916 photo of the Grant County mining town of Santa Rita, east of Silver City. By 1970, the town had vanished to make way for the expanding open-pit Chino Mine. The Chino Mine, the town of Santa Rita and the union all are tightly braided in Humble’s memories. “I can’t believe it’s over,” he said recently, sitting on a folding chair in the 1940s-era union hall in Bayard, where Local 890 members held often-raucous meetings for seven decades. In this hall in 1950, Local 890 members voted to strike for better pay and working conditions at an underground mine north of Bayard owned by the Empire Zinc Co. When a court injunction barred miners from manning the picket line, union members voted to allow women to continue the strike, over the strenuous objections of some miners. The 15-month action in 1950-52, called the Salt of the Earth strike, forced Empire Zinc to grant better pay and working conditions for the mine’s Hispanic workers. The strike was dramatized in the 1954 film “Salt of the Earth,” which was made by blacklisted filmmakers and cast with men and women who participated in the strike. The movie starred Juan Chacón, who served several terms as president of Local 890 from 1953-74. “That really was our civil rights movement, both for Hispanic women and men,” said Frances Gonzales, 49, whose father participated in the strike. Gonzales said she grew up around the union hall, where she attended meetings at her father’s side. Murals memorializing the Salt of the Earth strike line the hall inside and out. Salt of the Earth, both the strike and the movie, called attention to the dangerous and discriminatory conditions faced by Hispanic miners, both at the Chino Mine and the many underground mines that dotted the area. Local 890 led periodic strikes at the Chino Mine to put pressure on company leaders during contract talks, including a nine-month strike in 1967-68. Chacón often spoke for the union in news stories about the strikes. Mine Mill Local 890 was largely a Hispanic union, said Humble, who was among a handful of Anglo members. For many years, Hispanics were barred from the mine’s craft unions and the more-desirable jobs they represented. On the eve of the Sept. 18 union election, union leaders felt confident that they could fend off decertification, as they had in five previous elections from 1993 to 2004. In most cases, union members had voted nearly 2-to-1 to remain unionized. In 1998, for example, members voted 333-172 to reject decertification. Union leaders went door-to-door, handing out fliers and reminding members of the union’s heroic past. “We had done a lot of house visiting,” said Ray Teran, a 40-year employee of the Chino Mine and chairman of United Steelworkers Local 9424-3, the successor to Mine Mill Local 890. The results of the election, and the nearly 3-to-1 rejection of the union, stunned supporters. “It’s just kind of hard to stomach,” Teran, 61, said in an interview at the union hall, located about three miles west of the Chino Mine. Generational changes in attitudes toward unions help explain the results, he said. Most voting members were in their 20s and 30s, he said. Teran was one of only a half-dozen members who had worked at the mine 30 years or more. Dwindling membership over the years took a toll on the union, Humble said. At least 10 unions flourished at Grant County’s two copper mines in 1967 when Humble started work as a mechanic at the Chino Mine. Grant County’s mining workforce and union membership have fluctuated with the ups and downs in copper prices. The Chino Mine’s closure in 2008-09 may have delivered the fatal blow to the union, Humble said. In 2008, operations at Chino were curtailed and hundreds of miners laid off after copper prices dipped under $2 a pound. Union membership dwindled to just a couple of dozen while the mine was closed in 2008-09, he said. Copper prices have since rebounded to just over $3 a pound. In October 2010, Freeport-McMoRan announced it was restarting mining operations in Grant County. Today, 960 work at Chino and 620 at Tyrone, the company said. “Everybody that has been hired lately, in the last several years, are new hires – a lot of younger people who have no idea of the advantages or disadvantages of a union,” Humble said. Many say money also played a role in the union’s defeat. Teran and others contend that Freeport-McMoRan paid annual bonuses to workers at the non-union Tyrone Mine but not to Chino employees. Some miners believe they will get bonuses, and possibly pay raises, now that Chino is non-union, he said. Freeport-McMoRan said in a written statement that the company does not publicly discuss employee compensation. The Journal left repeated telephone messages with Irving Shane Shores, who organized the petition that led to the decertification vote, but they were not returned. Many area residents say they are relieved the mines have reopened, even if they may regret the death of the county’s last miners’ union. “This area is lucky to have (the mines), otherwise there wouldn’t be an economy in this area,” said Esther Gil, a councilwoman in Hurley, where Chino copper was smelted until 2007. Her husband belonged to a Chino Mine union until his retirement a decade ago. “Younger people don’t feel the attachment to the unions or understand that unions served an important purpose in improving people’s lives,” she said. 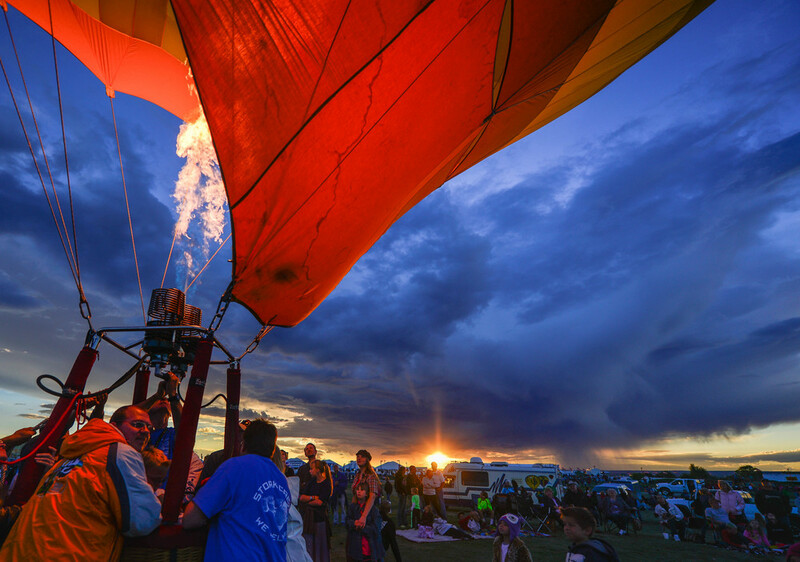 Tags: Ballon Fiesta 2014, Albuquerque, Balloon landing. A kid at UNM's Children's hospital gets a visit from local jockeys who brought gifts and smiles.